Utilizing the 3Ms of Process Improvement in Healthcare: A Roadmap to High Reliability Using Lean, Six Sigma, and Change Leadership details how to use the 3Ms (Measure, Manage to Measure, Make-it-Easy) of change leadership in healthcare. May 17, 2012 - PRLog -- Leading change in the right direction and sustaining that change is extremely difficult without managing the relevant measures, especially in today's healthcare environment. This book details how to use the 3Ms (Measure, Manage to Measure, Make-it-Easy) of change leadership in healthcare. It includes healthcare case studies that illustrate the proper application of the 3Ms. Complete with forms and templates to facilitate application of the 3Ms, the text describes a culture change method that is based on changing behaviors. 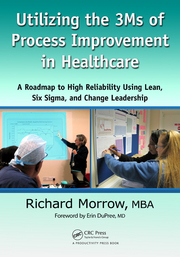 In this book, Rick Morrow provides a clear, structured, and disciplined approach to improving processes and systems in healthcare, an industry in great need of improvement. He gives readers great insight into how all the tools of improvement can indeed be used in an integrated approach to improve reliability of care, clinical utilization, quality, patient safety, and efficiency. He wraps this around straightforward steps and the management systems required to sustain improvements. A must read for all looking to improve a complex organization and delivery system. With Rick Morrow’s help, we were able to reduce hospital acquired infections by over 50% using the tenets described in this book. Those improvements have been sustained. Rick provides a simple and elegant description of improvement methods and how to apply them. Those serious about performance could benefit from this book. As an international expert in quality and safety, Utilizing the 3Ms of Process Improvement for Healthcare is my go-to-guide for practical applications in process improvement. This is a must read for all healthcare professionals looking to create sustainable processes and improve outcomes. The stories that Rick shares in this book, I think, everyone can relate to. His ability to translate difficult lessons into easy, memorable stories will engage even the most skeptical readers. … This book includes a step-by-step approach to change that begins with proven techniques. … includes templates that guide teams in driving change and utilization of the 3Ms for process improvement. This book is a great place to start your journey in process improvement. The key to longevity and success in process improvement is the utilization of the 3Ms. I can’t imagine succeeding without the concepts shared in this book. I have made it a habit to listen more carefully to those who have actually been successful doing what they teach. Rick Morrow has the track record to back up the methodology suggested in his book. To the degree that it is theory, it is theory tested and proven on the front lines. He is a veteran in the ongoing ware to improve the patient experience, reduce waste and enhance quality of the care we provide. As such, he is worth listening to. Take the time to read his book. It will be time well invested. Rick Morrow is a consultant with more than 25 years of senior leadership experience in healthcare, aviation, construction, automotive and high tech. Morrow leads Healthcare Performance Partners’ Quality, Safety, and High Reliability unit, a MedAssets company. He has authored Lean Six Sigma performance excellence courses and taught and deployed programs internationally for Eaton Corporation, SKF, Motorola, United Airlines, The Joint Commission, and Healthcare Performance Partners.